Every marriage is unique, expressed by the colorful personalities of each spouse and textured by the circumstances at play in their lives. Blending these to make marriage work is a divinely inspired art form — challenging to master but definitely worth the effort. a workbook couple's set, each containing group discussion questions, mini-projects for completion during group meetings, date-night suggestions for couples, and articles and tips for improving marriage. With minimal preparation, The Art of Marriage small-group series can make a lasting impact in the marriages in your church and community. Need help getting started? Ask a Ministry Advisor. For additional small-group studies on marriage topics, see The Art of Marriage Connect Series/Homebuilders Couples Series. 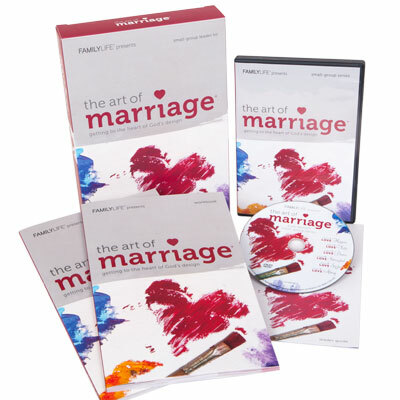 The Art of Marriage® Small Group Starter Pack! The mission of FamilyLife® mission is to build godly marriages and families that will change the world, one home at a time. It expands with our compassion for families in need of help, and for those the Bible calls helpless. Through our conferences, broadcasts, web site, and resources, we are seeing God rewrite the legacies of husbands, wives, and children everywhere. Product Dimensions: 6.75" x 10" x 1.625"